Last week, we discussed the mysterious aspect of thundersnow. This week, we'll discuss the mysterious aspect of lake effect snow. What comes to mind when you think of lake effect snow (LES)? Probably epic snowfall rates, places where "nobody lives," and really cold weather. And you would be accurate in that assessment. I worked for almost five years in Upstate NY, forecasting LES routinely. It's fascinating, it's challenging, and it can be a royal pain in the neck. Let's discuss some aspects of it. First, what is lake effect snow? LES is rooted in one simple concept: Cold air moves over the relatively warmer Great Lakes, acquires moisture and deposits moisture downwind on the other side of the lakes. Because it's usually cold, this often falls as snow. In reality, it's never this simple. 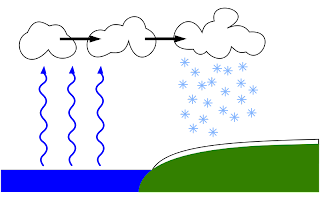 The lake temperatures and the upper air temperatures must satisfy certain requirements, must have a certain "delta" (difference), the wind trajectories must occur in certain ways, wind speeds must occur at certain levels, etc., etc. There are multitudes of factors that differentiates serious LES from routine LES. Let's go over a an example. The rough rule of thumb is that the difference between the lake temperature and the air temperature at 850 mb (or roughly 5,000 feet up) must be 13°C to get LES going. It doesn't always work in a vacuum like that, but it's the general rule. Let's say that the water temperature of Lake Ontario is 41°F. Convert that to Celsius for 5°C. That means that the 850 mb temperature would need to be at least -8°C to generate lake effect precipitation. If the upper air temp is -5 to -7°C, you might generate some cumulus clouds off the lake. -8°C will get showers going (that can also fall as rain...the surface air temperatures still need to qualify cold enough to allow for it to snow...but at that 13° difference between the 850 mb temp and lake temp, you will likely generate precip of some sort). Anything below -8°C when the lake is +5°C would mean increased instability and heavier precipitation potential. So let's go for a rather average case. Let's say a cold front is sweeping across the Great Lakes in late November or early December. Lake Ontario is sitting at +5°C. The air at 850 mb behind the front drops to about -14°C. As that air moves in on northwesterly winds, clouds will build up and precipitation will begin on the downwind side of the lake. So we now have the lake effect machine cranking, right? Not necessarily. The next consideration is what we call "fetch." In other words, we need to know how long the air is going to be traveling over the lake or over a moisture source. To the left, you see a diagram of Lake Ontario. 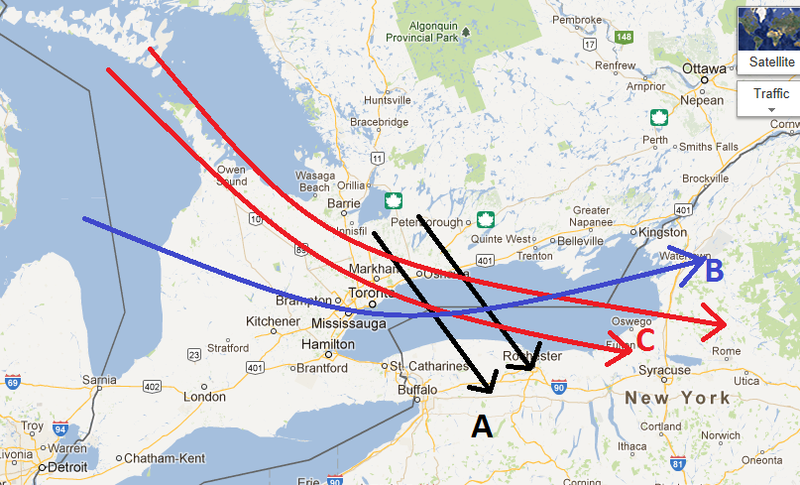 I've labeled three classic LES trajectories: A, B, and C.
Scenario A: Winds are due northwest or more NNW in nature. This will ensure that air will travel over the shortest portion of Lake Ontario, limiting the amount of time it has to pick up moisture. While this wind trajectory would be favorable over Lake Huron (at far left on the map) or even Lake Michigan, it is not favorable for Lake Ontario. In this instance, you'll likely see what we call a multi-band spray of LES, with just a blob of light to moderate snow, with a few heavier bands mixed in. This would be an example radar image. Scenario B: Winds are westerly or even west-southwesterly. You don't often think about cold air arriving on southwest winds in and around Philly, but in many cases, especially up in New York, this occurs. This will send the air over the longest, or close to the longest stretch of lake, meaning it will maximize the amount of moisture it can pick up. This will translate to a more focused heavier band of snow on the downwind side of the lake. This is where we usually see the single, monster band of snow, with embedded thunder and snowfall rates in excess of 2-3" per hour. An example of this on radar is shown here. Now, there are other factors that can limit this, and we'll get into those shortly. Scenario C: Similar to B, but with more of a northerly component before getting to Lake Ontario and westerly component over Lake Ontario. Why does this matter? Because in this scenario, the lake band can be juiced by additional moisture from either Lake Huron or Georgian Bay (or even Lakes Superior or Michigan in a rare case). You can also "juice the band" on southwest winds, when the fetch is across much of Lake Erie and ends up hitting areas around and north of Watertown, NY. Upstream connections are an underplayed aspect of lake snow. Sometimes when you think the trajectories will be shifting to something unfavorable, you briefly align the winds such that you get a burst of really heavy snow because of that connection. So I hope those scenarios provide you with at least some examples to understand the complexities involved in LES. Ultimately, what it comes down to is wind direction and forecasting that wind direction over a very broad geographic area. What can go wrong? Remember, it's "all" about wind forecasting...but it's not just surface winds. It's upper level winds too. If you have westerly winds at the surface but northerly winds aloft, you have too much shear (change in direction with height). You'll never allow a band to form and sustain itself because it will be getting pushed in different directions. So this creates a challenge in forecasting. Another consideration is what we call speed shear. If you have westerly winds at the surface and also above the surface up to 5,000-10,000 feet, you're in business, right? Well if the winds at the surface are 20 mph, but at 7,000 feet they're 80 mph, you'll essentially just be spraying a bunch of snow far inland. The band will never have time to congeal. If you have similar winds aloft and at the surface, the band will organize, provided everything else falls into place. Stronger winds and it will penetrate further inland, and weaker winds mean it will stay closer to the lakeshore. Other considerations include upstream humidity. Cold air is often dry, so if you have a quick moving high pressure system behind the front, the atmosphere will dry out and the moisture will not be as plentiful, thus the lake precipitation will likely shut down or be just some flurries. Additionally, in a cold season trough, you can often have shortwave troughs, or weak upper level disturbances pinwheel around the trough and over the lakes. Each time one of these moves over an LES zone, it can add instability and "energy" to juice up the band of snow. Usually that comes with a wind shift as well, and often times it can "sweep" the lake snows off the lake and provide a 30 minute or so burst of extremely heavy snow. Ultimately, it depends on lake temps, upper air temps, and wind direction. As the lakes cool off through winter, the moisture source will become less potent and widespread. As the lakes freeze (not all of them freeze and Lake Ontario for instance never freezes over completely) that moisture source shuts down, and you get less production of snow. To this point: Lake snows are most prolific from November through January and gradually taper off through February (unless like in 2006-07, you have a very warm front half of winter and a very cold back half; then the end result will be epic snows late in winter). Lake effect snow is a tremendously complex and challenging phenomenon. It's driven by small scale processes in addition to larger scale patterns, both of which the models struggle with at times, making it even more difficult to forecast. All snow is challenging, but I hope this introduces you to the fascinating aspect of lake effect snow.